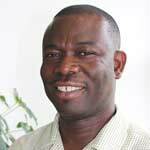 Dr. Benjamin Kwasi Addom is an ICT4D Programme Coordinator at the Technical Centre for Agricultural and Rural Cooperation (CTA), based in the Netherlands. Since 2013, Ben has been coordinating activities that support the uptake, utilization and scaling of ICT solutions (mobile inclusive) for agriculture in African, Caribbean and Pacific (ACP) countries. Ben is an international development professional who specialises in the application of ICTs for agriculture, food security, and rural development. Prior to his graduate studies, he spent over 4 years as agricultural extension supervisor with both the private and public sectors in Ghana. He undertook a number of consultancy assignments with international organizations such as FAO, USAID, NEPAD, and CTA in exploring mobile technologies and social media in agricultural knowledge management between 2009 and 2013. He holds a doctorate in information science and technology with concentration in community informatics, innovation systems, and knowledge management from Syracuse University, USA; masters in international agriculture and rural development with focus on extension and training from Cornell University, USA; and bachelors in general agriculture from the University of Cape Coast, Ghana. His doctoral dissertation explored the concept of knowledge brokering within agricultural innovation system in the digital age.